HEINE® HR 2.5 x Binocular Loupes – Fully customised magnification system for every application. High-resolution achromatically correct lens system with edge-to-edge clarity and detail. Made in Germany. i-View Loupe Mount. Easy loupe adjustment and flip-up system. Precision Optics. Ground optical grade glass lenses with anti-reflective coatings provide crisp, high-resolution images. Every examination situation is different, every working distance is different and every interpupillary distance is different. Therefore we have 4 simple steps to guarantee we recommend the best Loupe configuration for you to ensure you get the most out of your HEINE Loupes. 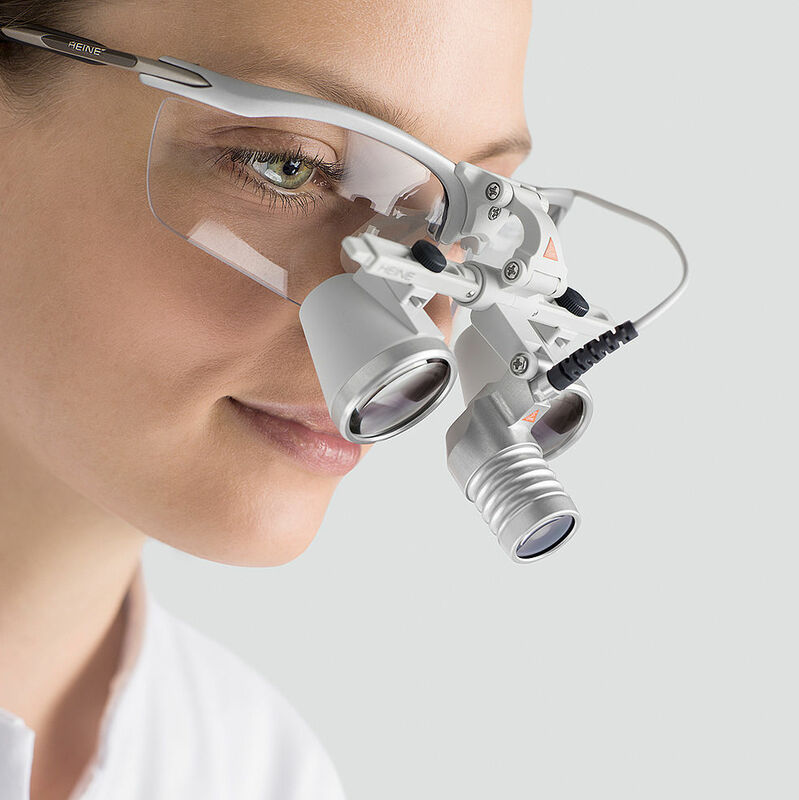 Your HEINE Partner will help you to adjust and customise your loupe to your individual requirements, providing you with a reliable instrument that will serve you for many years to come. 1. Choose your magnification. Most of our customers choose a HR 2.5x Binocular Loupe due to the ideal combination of a large field of view, excellent depth of field and magnifiaction. For other magnifications, please contact your HEINE Partner. 2. Choose your working distance. The visual sharpness of the focal area varies depending on the working field and the size of the user. 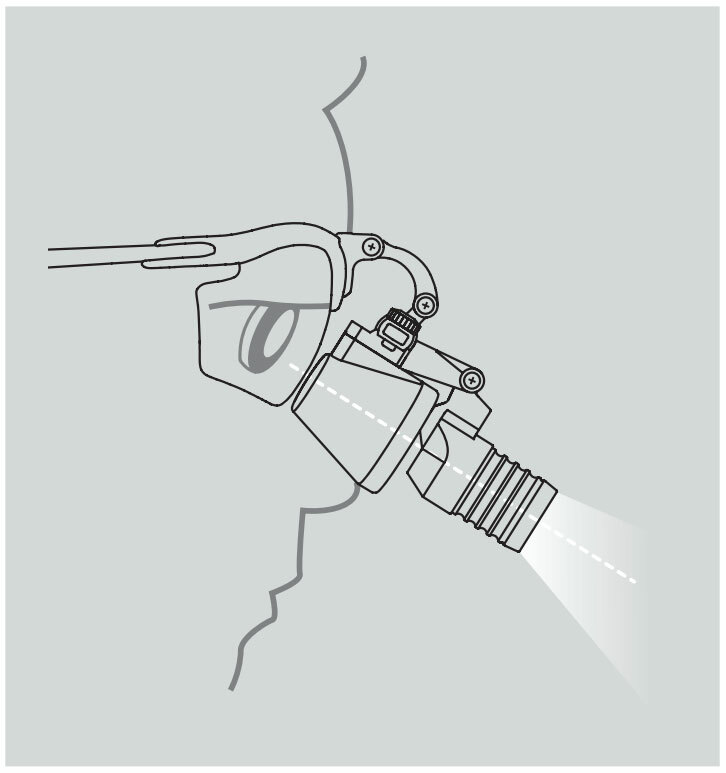 We offer our loupes for working distances of 340mm, 420mm and 520mm. For the majority of health professionals a working distance of 420mm has proven to be ideal. 3. Choose your mounting option. Lightweight spectacle frame or headband for fatigue-free work. 4. Choose your illumination. Compact and lightweight LED LoupeLight or the comfortable ML4 LED HeadLight with the Professional L Headband. The perfect match for the most accurate examination. The combination of light and loupe delivers the ultimate in performance as high quality illumination maximizes the image quality of the loupe. Featuring LED-HQ illumination for homogeneous illumination with accurate colour rendering that fills the entire field of view from edge-to-edge, the LED LoupeLight 2 is the perfect compliment to the 2.5x magnification. All in all, a perfectly matched system with high quality components. For those who need a compact, lightweight illumination solution without magnification, we offer the LED MicroLight 2. Featuring LED-HQ illumination for homogeneous illumination with true and natural colour rendering for every examination situation. Two mounting options offer individuality and easy handling. Illumination without compromises, in a lightweight design. Adjustable viewing angle over a wide range provides a completely shadow-free image and coaxial illumination of difficult to see areas. Exclusive aluminium housing is lightweight and protects the optics against dust and moisture to ensure an extraordinary long lifespan. 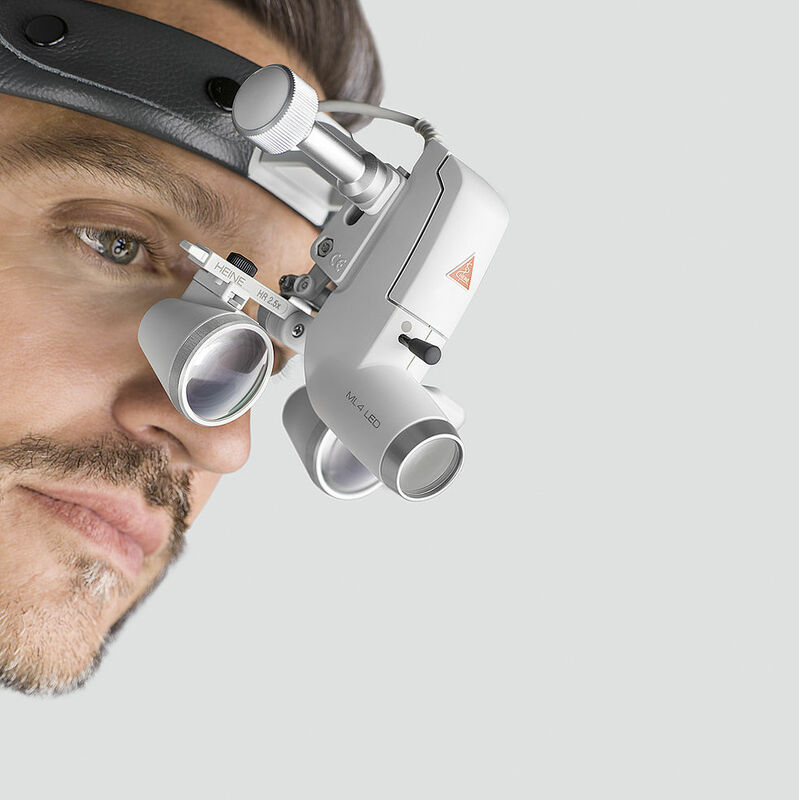 The adjustable viewing angle ensures a completely shadow-free image and coaxial illumination in all examination situations. Precision lenses combined with LEDs in HEINE Quality provide an absolutely bright light spot that is uniform from edge-to-edge. The ML4 LED HeadLight Professional L Headband has multiple adjustment points for comfort and stability – ideal for long procedures. 100% freedom with a choice of cable-free mPack UNPLUGGED head-worn battery or mPack belt-worn battery pack. Adjustable from 30mm to 80mm (at a working distance of 420mm) to fit any examination situation. To be able to discern even the slightest abnormalities, it is necessary to properly illuminate the object being examined. It’s not a question of utilising the brightest LED available, but utilising the right LED and combining it with the optical system of the instrument to achieve the optimum brightness for the examination. This is guaranteed with all of our HEINE LED-HQ instruments. Coaxial and homogeneous illumination with an absolutely bright light spot that is uniform from edge-to-edge for the perfect illumination of difficult to see areas. The Colour Rendering Index (CRI) indicates how exactly colours are reproduced in comparison with daylight. The ML4 LED HeadLight produces an excellent CRI value of 90. Result: Red is red and blue is blue. For an absolute reliable and accurate diagnosis. LEDs provide optimal performance only in special temperature ranges. Too little or too much heat affects brightness, colour temperature, and reduces the life time. A compact, ergonomic design with heat-conducting foil and aluminium heat sink help maintain the optimal temperature range of the LEDs. Integrated high quality LEDs have a virtually unlimited working life. HEINE LED Headlights are maintenancefree. The battery life is extended by the high efficiency of the LEDs and their low power consumption. HEINE makes no compromises in manufacturing high quality medical instruments. Our commitment to vertical integration in manufacturing means we control all aspects of our instrument quality, from utilising carefully selected, well-matched materials to a high level of hand assembly. This ensures that each HEINE instrument meets or exceeds all requirements in any medical environment. 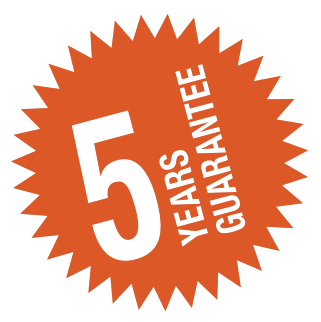 We stand behind this commitment with a 5 year guarantee!